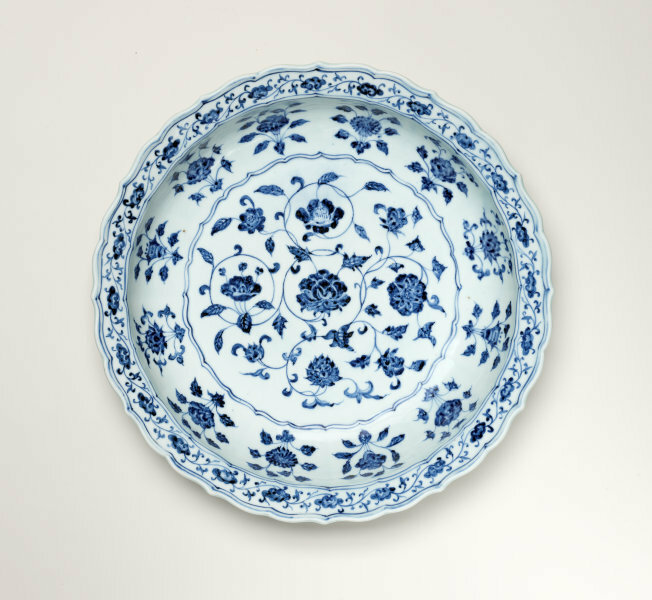 This superb dish, nearly 600 years old, is of a technical and artistic standard that has rarely been matched. It was created in the Yongle reign (1403-1424) of the Ming dynasty, one of the most splendid periods in Chinese history. It was the Yongle emperor who established the Imperial capital at Beijing and who was responsible for the planning and initiation of the Forbidden city which still stands today as a monument to grandeur and human aspirations. His patronage of the arts embraced a strong support of the porcelain factories at Jingdezhen to the south where potters had already begun mastering the magical local clays that enabled them to create the translucent, high fired, white bodied material now known to the West as 'porcelain'. The use of cobalt blue was relatively new in the Yongle period. Potters had begun using it for decoration in the preceding Yuan dynasty (1279 - 1368) when merchants trading with the Near East required 'showy' decorative pieces to meet the taste of that market. The Islamic market wanted larger objects and potters had to devise methods of making a porcelain that was denser and harder to resist the kiln hazards of firing large pieces and the hazards of transportation west. The Near East was the catalyst for the new designs that began appearing on 14th century porcelain: the precious cobalt blue, extremely difficult to manipulate and control in firing was provided by Near Eastern merchants, and the shapes and designs were inspired by Persian metal prototypes. The taste of the ruling Chinese literati had favoured refined monochromes with understated design, and initially disliked the lively 'showy' blue and white porcelain. However in the early Ming dynasty, imperial taste adopted decorated ceramics as their own, and the demanding patronage then exerted on the Jingdezhen kilns resulted in superb pieces such as this plate. The later fame of wares of the Yongle reign was well earned for new standards were achieved in every department of the manufacture - in the refinement of the clay and glaze, in shaping, and in decoration. In regard to the decoration, floral scrolls and sprays, incorporating many types of bloom, were the most popular. The 'flowers of the four seasons,' the decoration on this plate, was a theme particularly favoured, incorporating a wide variety of blooms such as peony, camellia, Indian lotus, chrysanthemum, etc. While the compositional arrangement of such designs was influenced by Persian textile and metalwork designs, the particular symbolism of each of these flowers had special connotations for a Chinese audience, i.e., the peony a symbol of wealth. A purely Chinese motif is the rim decoration of 'lingzhi', the fungus of immortality which according to Daoist legend grew on the Isles of the Blessed in the Eastern Seas. Because of the powerful influence of Imperial patronage it is a fair supposition that the decoration on these dishes reflects the artistic preferences of the discerning 15th century court. Asian Art Department, AGNSW, November 1988.